A gifted vocalist with over three decades of experience dating back to his early years doing theatrical works at Princeton University, Steve Washington has a skillful, soulful way of covering a classic song and invigorating it for a modern audience as he does on his second album, Right to Love. Collaborating with the Thad Wilson Jazz Orchestra, Washington breathes new life to a tasteful selection of standards, all of which are personally and beautifully interpreted. Washington plumbs the emotional depths of these tracks, singing from his big, beating heart instead of focusing mainly on technical expertise. Washington's version of "Caravan" is vibrant, festive, and exciting; it's fast and lively melody feels real and alive. Washington's performance on "Caravan" is brightly lit and enchanting. Washington captures the untainted joy of "Alright, Okay, You Win" with heartwarming affection. Washington's icy cool and soothing vocal blends perfectly with Wilson's lush orchestration. This track's dramatic pulse will keep ears glued to the speakers. The song is all about making sacrifices, enduring hardships, and the wonder of living a life together with his or her special someone. With Washington and Wilson's orchestra, it is pure magic. Washington does a stellar job in making each and every cover on the album sound like his own. Every is brimming with honest feeling and passion, a truly mesmerizing experience. Track Listing: Caravan; Corcovado; The Lamp Is Low; Alright, Okay, You Win; I Was Telling Her About You; MacArthur Park; Avalon; The Right to Love. Bonus track – MacArthur Park (alternate take). Personnel: Tracks 1, 5, 8 – Steve Washington: vocals; Thad Wilson: leader, conductor; Alvin Trask: trumpet; Joseph Brotherton: trumpet; Tom Williams: trumpet; Antonio Parker: alto sax; Robert Landham: alto sax; Brian Settles: tenor sax; Elijah Easton: tenor sax; Tissa Khosla: baritone sax; Shannon Gunn: trombone; Christian Hizon: trombone; Reginal Cyntje: trombone; Mark Meadows: piano; David Jernigan: bass; Allen Jones: drums. 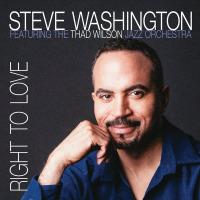 Tracks 4, 5, 7 – Steve Washington: vocals; Thad Wilson, leader, conductor, trumpet; Andrew Flores: piano; Steve Novosef: bass; Harold Summey: drums; other personnel as on Tracks 1, 5, 8. Tracks 2, 3 – Add Alex Norris: trumpet, flugelhorn (solo on 2); Allen Jones: drums, replaces Summey; other personnel as on Tracks 4, 5, 7.